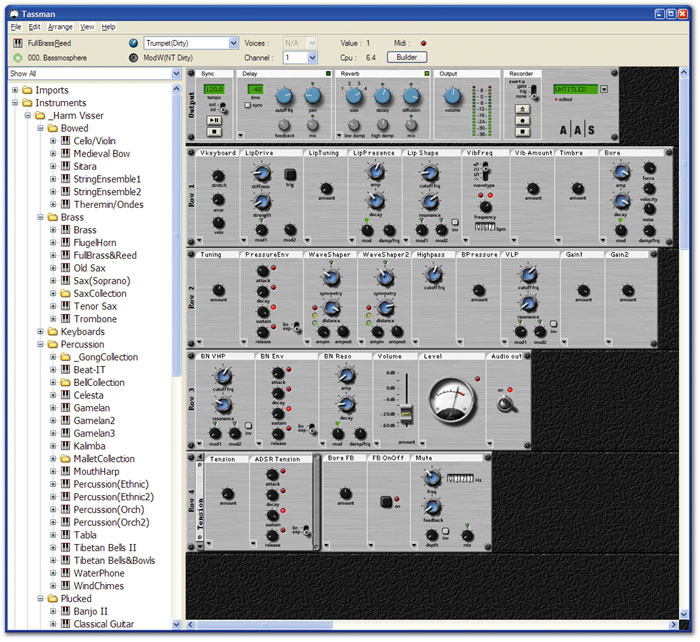 Applied Acoustic Systems' Tassman software modular synth offers one of the best selections of software-based physical modelling options available today, and is ideal for programmers who want to create realistic-sounding acoustic instruments in virtual form. Its bundled library contains many fascinating glimpses of what's possible, but I've always felt that there was still plenty of untapped potential waiting to be explored. Harm Visser of HV Synth Design obviously thought so too, and has not only explored some of this potential but collected together the results of his efforts in a large (and still-expanding) collection of Tassman instruments that covers a great deal of sonic ground. Currently standing at 79 instruments, the collection ranges from keyboards ancient and modern to a comprehensive set of orchestral and ethnic percussion, an extensive brass and woodwind collection, a small section of bowed strings, lots of plucked strings, plus some exotic options covering granular synthesis, soundscapes, and vocal simulations. Harm is no stranger to physical modelling (his web site also sells the largest collection of physically modelled instrument plug-ins available for Korg's OASYS) and he has spent years studying the physics behind instrument sound production. The results speak for themselves, and there are MP3 demos available for each Tassman instrument to prove the point. To give you an idea of the complexity of these instruments, the collection's Tibetan bells and bowed bowls start life in Tassman as a model of a mallet striking a string, whose output is fed into a pair of parallel plates tuned to slightly differing frequencies to provide the characteristic metallic shimmer. Meanwhile, a pair of bowed beams is excited by a 'FrictionWave' sample whose amplitude is under the control of your mod wheel, so you can add the sound of the bowl being scraped to make it 'sing'. With a low-pass filter to control the amount of scrape, you have full control over all aspects of the sound in real time, and the result is far more realistic and expressive than a bunch of samples can ever be. Other standout percussion instruments for me included the struck, bowed, and scraped gong collection and the three sets of Gamelan sounds, the expressive tabla, and the exotic sounds of the waterphone using the sound of a plate being 'filled' by another plate, which was controlled from the mod wheel. In the hands of an expressive player (especially one with a breath controller) the alto, baritone, bass, soprano, and tenor of the saxophone collection really come to life, as do the throaty trumpet and fruity trombone, while Harm is particularly proud of the 'FullBrass&Reed' collection, which you can 'overblow' using the mod wheel to produce the natural tones of the harmonic series, with or without mutes. More mellow woodwind sounds are also well represented, with (among many others) a warm jazz flute, medieval shawm, and even a fair stab at the resonant manipulations of a didgeridoo! There's also a lot of plucked instruments in the collection, ranging from a very realistic banjo and funky clavinet to tremolo mandolin, multiple guitars, several kotos, a santur (dulcimer) with a choice of tunings (12, 24, or 48 tones in an octave), while the two sitars provided the first virtual playable experience of this instrument that I've ever had, with the sympathetic strings played by the keyboard, and the melody string pitch played by the mod wheel. Another hit for me was the classical harp, which captures the delicacy and expressiveness of the real instrument far better than most sample-based libraries, while the bowed section includes both modern and medieval strings, ensembles, and the portamento of the theremin. In the keyboards section, the church organ uses three sets of pipes, so you can create a wide variety of timbres, while the pipe organ has the characteristic 'chiff'. Surprisingly, both use bowed string modules, but are very playable, and you can ramp up the polyphony, as they are fairly CPU-light. The honky-tonk and electric pianos sound good, too, but need plenty of your processor if played with reasonable polyphony. There are also many male and female voice-like instruments which make use of formant synthesis, plus choirs and effects, and more intriguing experimental sounds, such as those produced by grain clouds (heard in 'Gloudia' and 'Granularity'). Although I personally found the latter rather less useful, they might prove perfect for you — take a listen to the MP3 demos and decide for yourself. Overall, there ought to be plenty for every Tassman user in this collection. If you want to try out instruments individually, Harm is quite happy for you to buy each instrument separately — and prices are very modest, ranging from $8.50 upwards. However, those who decide to buy the entire bundle can do so for just $199 (around £115) — an incredible discount, especially since this entitles you to every future instrument that Harm creates completely free of charge. A large range of nicely expressive instruments. A few of the instruments are CPU-intensive. HV Synth Design's Total Tassman package is an absolute must for any Tassman user who wants to see what the software is capable of — especially if they use MIDI controllers a lot. $199 (download only — around £115 at time of going to press). Individual instruments available from $8.50 (approximately £5).